Unknown. It will lay eggs in freshwater, but they won't survive since the young need brackish, or saltwater conditions to live. A peaceful snail, will not bother tank inhabitants. However, should not be kept with aggressive fish that may try to eat it such as Loaches or Pufferfish. 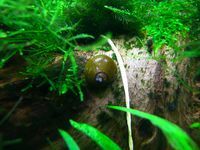 This snail is a great algae eater. Generally will not touch plants and will eat most types of algae. If no algae is present the snail will have to be supplemented with blanched vegetables and algae wafers. Will eat cucumbers. Needs a spacious well oxygenated tank with plenty of algae to eat. If put in a new tank with no algae present and not supplemented, it can starve. A tight fitting lid is a must as these snails can be escape artists. Make sure pH isn't too acidic and water isn't too soft, or the shell will dissolve and the snail will die. These are also good marine tank inhabitants if acclimated to full-strength saltwater. An attractive snail that will not multiply. They may lay eggs however, but they will not hatch, as the young need brackish, and or saltwater conditions due to the fact that larvae need the saltwater's calcium, and minerals to build up their shells; for that reason, you will have the most success rearing them in full-blown marine saltwater, and the adults can make residence in brackish, and marine setups. Eggs are difficult to scrape off. A pretty rounded smooth shell with a deep green colour giving them their common name. This page was last edited on 5 December 2018, at 02:42.